The following songs have spent 30 or more weeks in the top ten. ^ Staff reporter (November 6, 1996). "First Look: The No. 1 That Got Away". People. 46 (19): 137. Retrieved November 4, 2012. Call it a case of bad timing. Were it not for the Macarena, Donna Lewis would have had the top-ranked song in the US for nine straight weeks beginning in late August. ^ a b c d e Trust, Gary (May 16, 2018). "Ed Sheeran's 'Perfect' Is Just 10th Single to Spend at Least Half a Year in Hot 100's Top 10". Billboard. Nielsen Global Media. Retrieved May 16, 2018. ^ "Here Are the 34 Hits That Have Debuted at No. 1 On the Hot 100". Billboard. Billboard Music. March 11, 2019. Retrieved March 11, 2019. ^ Silvio Pietroluongo (January 28, 2009). "Kelly Clarkson Breaks Record For Hot 100 Jump". Billboard. Retrieved January 28, 2009. ^ Trust, Gary (August 4, 2009). "Backwards Bullets: This Week In Charts 1996". Billboard. Retrieved January 28, 2009. 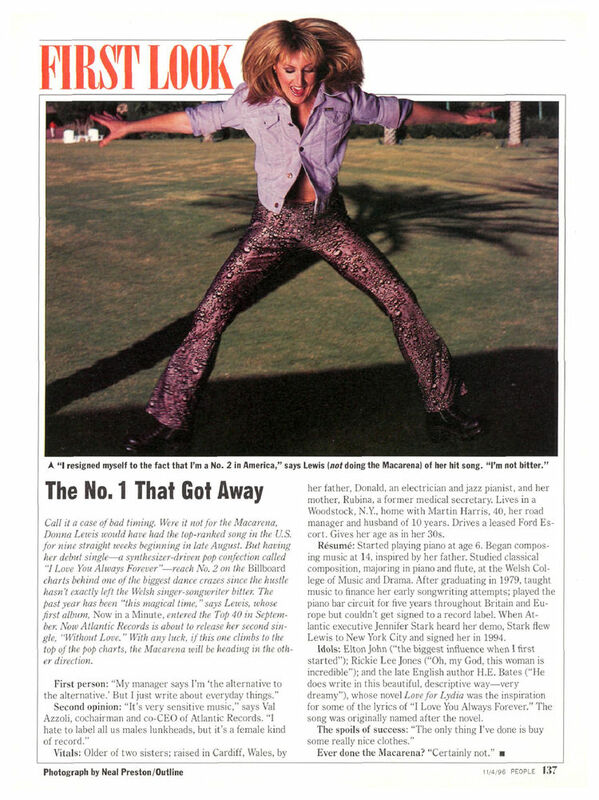 ^ a b "Janet Jackson's Biggest Billboard Hot 100 Hits". Billboard. Retrieved October 12, 2017. ^ a b c Bronson, Fred (April 3, 2008). "Chart Beat: Fred discusses chart action on Mariah Carey/Madonna/Elvis Presley, James Brown, Fantasia and more!". billboard.com. Billboard Magazine. Retrieved March 14, 2018. Elvis collected his 17th No. 1 in November 1969 when "Suspicious Minds" became the final Hot 100 chart-topper of his career. ^ Bronson, Fred (April 3, 2008). "Chart Beat: Fred discusses chart action on Mariah Carey/Madonna/Elvis Presley, James Brown, Fantasia and more!". billboard.com. Billboard Music. Retrieved March 14, 2018. Until this week, Presley and Madonna were tied with 36 top 10 hits in the rock era, the highest total for any artist. ^ "Janet Jackson Hot 100 Chart History". billboard.com. Billboard Music. Retrieved January 12, 2019. ^ a b c d e f Zellner, Xander (April 30, 2018). "Ariana Grande Scores 9th Billboard Hot 100 Top 10 With 'No Tears Left to Cry'". billboard.com. Billboard Music. Retrieved May 1, 2018. ^ a b Zellner, Xander. "Lil Wayne Charts 22 Songs From 'Tha Carter V' on Billboard Hot 100". Billboard. Retrieved October 8, 2018. ^ a b c d e f g h i Trust, Gary; Zellner, Xander (June 12, 2018). "Kanye West Debuts All 7 Songs From 'Ye' in Billboard Hot 100's Top 40". billboard.com. Billboard Music. Retrieved June 12, 2018. ^ "Nicki Minaj Hot 100 Chart History". billboard.com. Billboard Music. Retrieved August 7, 2018. ^ a b c d Trust, Gary (June 22, 2018). "Hot 100 Chart Moves: Taylor Swift's 'Delicate' Becomes Second Radio Songs Top 10 From 'Reputation'". billboard.com. Billboard Music. Retrieved June 22, 2018. ^ Anderson, Trevor (June 13, 2018). "Future Wraps Fifth-Longest Hot 100 Charting Streak After 166 Weeks". billboard.com. Billboard Music. Retrieved June 13, 2018. ^ Trust, Gary (May 21, 2018). "Childish Gambino's 'This Is America' Leads Hot 100, & All-Rap Top Four, For Second Week". Billboard. Retrieved May 21, 2018. ^ a b Anderson, Trevor (March 13, 2018). "Rewinding the Charts: 'Believe' It, Cher Took Auto-Tune to No. 1 in 1999". Billboard Magazine. Billboard Music. Retrieved March 14, 2018. ^ Platon, Adelle (April 24, 2017). "DJ Khaled Uses Son Asahd as Cover Art for Stacked 'I'm the One' Single Feat. Lil Wayne, Quavo, Chance the Rapper & Justin Bieber". Billboard. Billboard Music. Retrieved November 24, 2017. ^ Fresh, Mikey (February 13, 2017). "DJ Khaled Shares His "Shining" Moment With Beyoncé And JAY-Z". Vibe. Billboard Music. Retrieved November 24, 2017. ^ a b "Cher Chart History". billboard.com. Billboard Music. Retrieved March 14, 2018. ^ "Santana Chart Histiry". billboard.com. Billboard Music. Retrieved March 14, 2018. ^ a b c "Mariah Carey's 'Christmas' Climbs to No. 3 on Billboard Hot 100, Ariana Grande's 'Next' Leads for Seventh Week". Billboard. Retrieved January 4, 2019. ^ "Cardi B Bests Beyonce for the Most Simultaneous Hot 100 Hits Among Women". Billboard. April 16, 2018. Retrieved April 17, 2018.